H&I | Can you name these TV shows by a single image from their Halloween episodes? Can you name these TV shows by a single image from their Halloween episodes? Boo! It's that time of year again. Time for candy, cobwebs and pumpkin spice everything. But our favorite part of Halloween is dressing up. Television shows love to celebrate the holiday, too. Can you unmask these classic TV series? Try to match the image with the correct show. Ghoul luck! Which Star Trek series featured these three spooky witches? Investigate this scene like a good detective. Does the name "Scali" ring a bell? Which 1980 sci-fi episode featured this Halloween shindig? This 1970s superhero show featured an early visit to a comic con. This gritty 1980s cop series had an episode titled "Killer in a Halloween Mask." Speaking of 1980s cop shows, recognize this lineup of undercover cops? See if you can place this Halloween scene from 1997's "Back from the Dead Again." 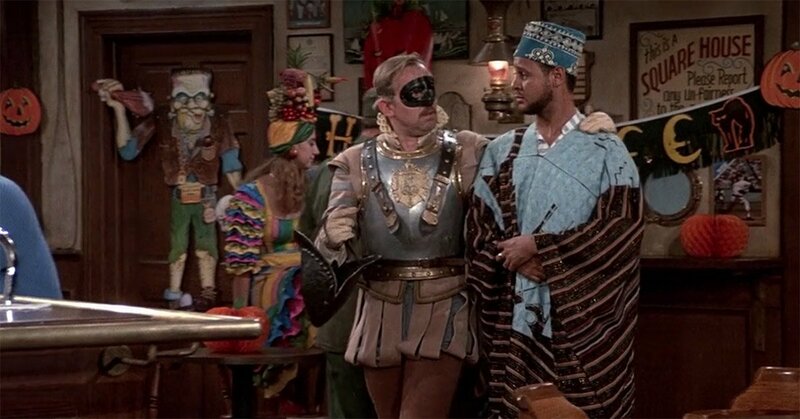 Which 1990s sitcoms featured these costumes? It's not a Halloween party without a limbo bar. Hint: Note the "El" tracks in the background of this Chicago-set show.